I’ve been busy preparing for the year clearing out the studio, priming work areas and contemplating a completely new body of work. After much lamenting, I have decided that the lines, patterns and ritual of drawing for the Cartography of Persistence series will continue. I am now in possession of 375 small repetitive drawings that have provided inspiration for new projects this year. They have transformed and I’ll be sure to keep you posted. A few new drawings that stem from these cartographies will also be posted in the gallery shortly. 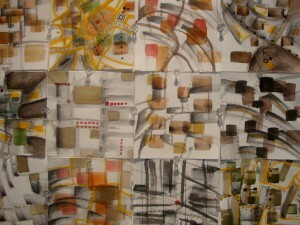 Watch for “Repetition Chart” selected from 2011 Drawings on the Gallery page.